There’s something about using real cranberries in recipes that just screams fall and winter baking! 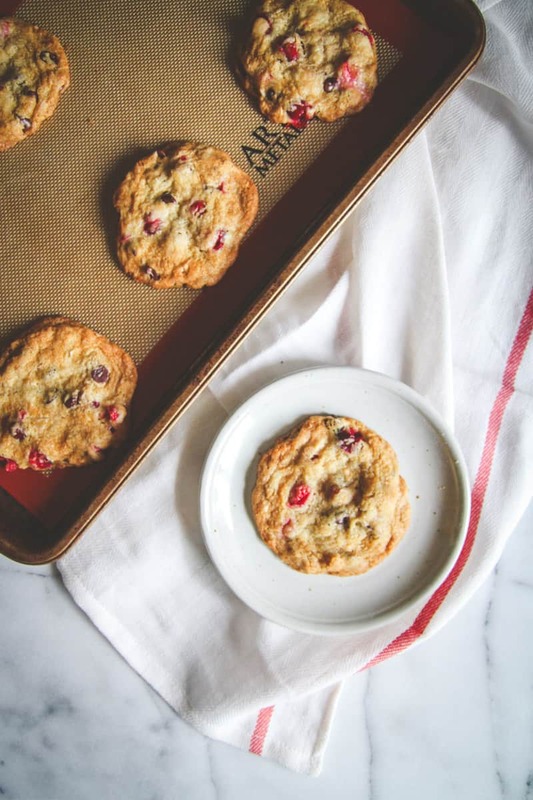 These big chocolate chip cranberry cookies are made with real cranberries and are my new favorite cookie for the holidays. As soon as my husband saw these cookies, he said “you made big cookies”! For years he’s been telling me about these big cookies they sell at his work. They’re the size of your hand, and are just awesome (he’s brought me one home to try). 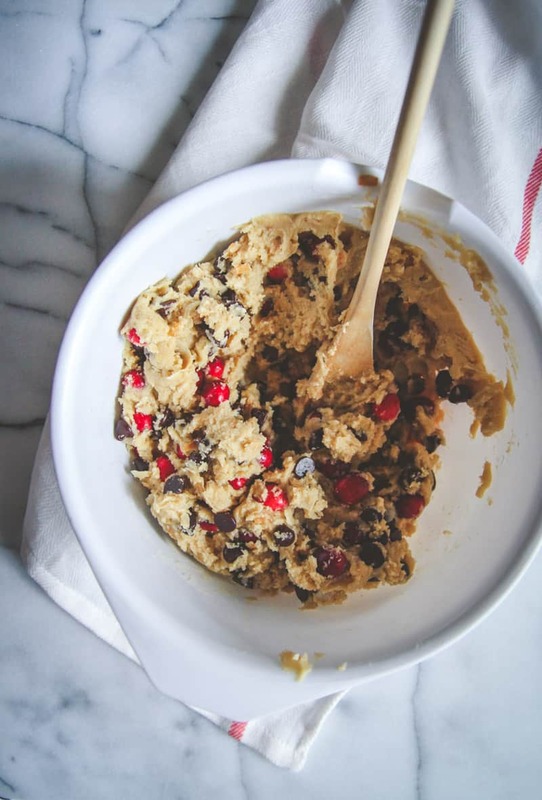 I have a big scoop that I usually use for muffins (like these gingerbread cranberry muffins) and as I was making the dough for these chocolate chip cranberry cookies and going to reach for the normal cookie scoop I use, I saw the big one and thought I’d give it a try. 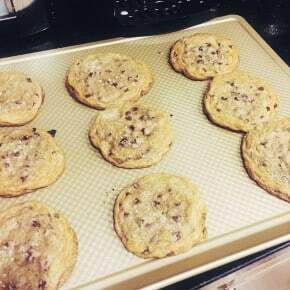 I am so glad I did, because I think these cookies work perfectly as big cookies. The cookies have a great texture, where they’re soft in the middle. 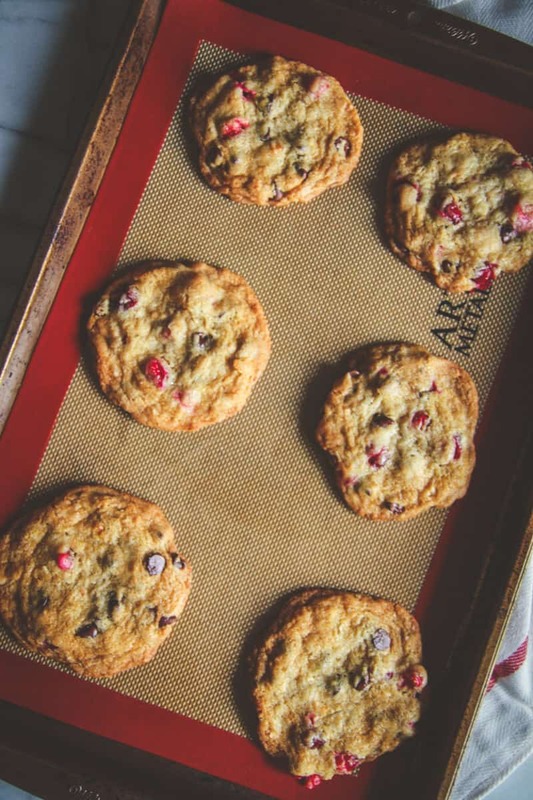 The real cranberries give the perfect tart contrast to the sweet chocolate chips. 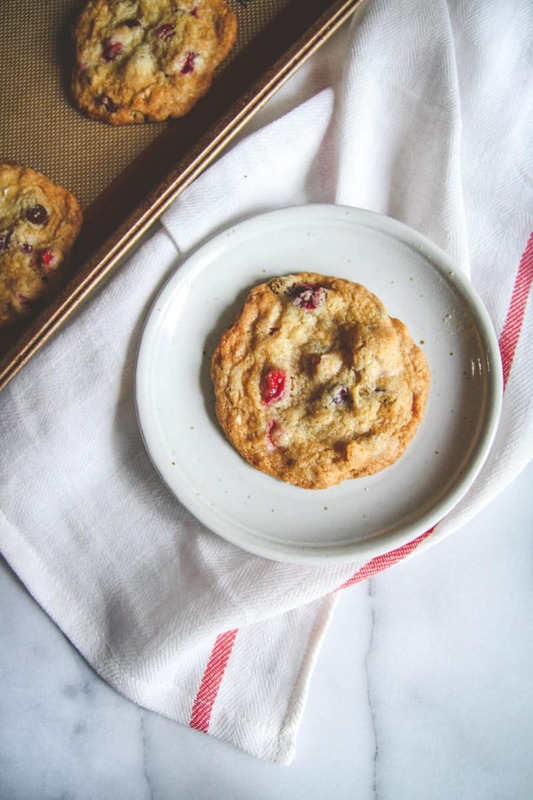 These chocolate chip cranberry cookies are perfect for the winter, and are a great winter baking recipe! Preheat oven to 350 degrees. 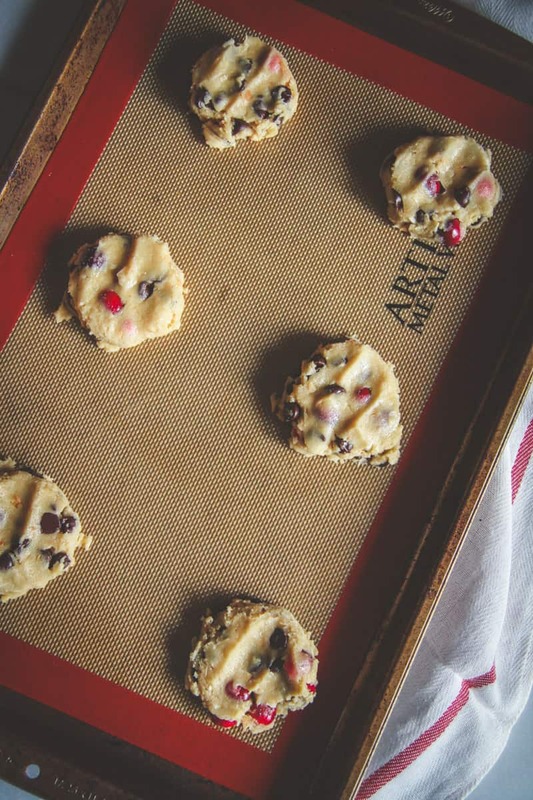 Line baking sheet(s) with silicone baking mat(s) or parchment paper and set aside. Toast coconut by placing coconut flakes on a lined baking sheet and baking for 5 minutes, until slightly browned and fragrant. Remove from oven and set aside. Warm the butter (I always keep mine in the fridge, so I simply microwave it for 30 seconds -1 minute). Add flour and baking soda to the bowl, then stir it with a wooden spoon. Add in coconut flakes, semi sweet chocolate chips and fresh cranberries. Stir to combine. 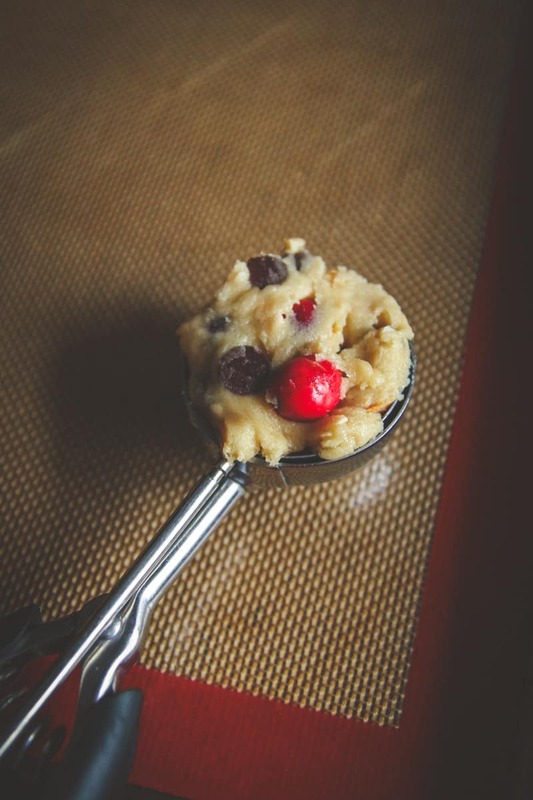 With a large cookie scoop (or forming large 3 tablespoon each dough balls with your hand), scoop cookie dough and place on prepared baking sheet about 3 inches between cookies (I get 6 cookies per tray). Slightly press dough down and bake for 13-17 minutes, or until the edges of the cookies start to brown. Remove from oven, and allow to cool for 10 minutes before transferring to a wire rack to cool completely. Yay! Real cranberries are SO much better than dried. These look so pretty! Thank you so much girl, appreciate you stopping by and commenting! Looks like the perfect cookie for holiday baking too! Thanks for sharing! These are so awesome for holiday baking, I’m making them for a holiday party next week 🙂 Thank you so much for commenting! Wishing you all Happy Holidays and an amazing 2018, full of love, health and prosperity! When thanksgiving and Christmas roll around, I make a habit of grabbing several bags to throw into the freezer. They last a long time!! I use them in stuffing with fruit and herbs; great addition to stir fry? Think about all the different combinations with leftovers! Leftover turkey, fresh sweet potatoes, green beans or peas, brocolli, a bit of frozen orange juice, a dash of soy sauce and wa-la? You have reconstructed Turkey Dinner!